The ferry ride from Petersburg to Juneau was our longest ride to date, lasting eight hours. It was also the noisiest ride to date with lots of kids, including a school group from Petersburg. Taking part in sports or other extracurricular activities is much more complicated in Southeast Alaska. Traveling to another school for a softball game, for example, involves a ride on the ferry. I think it’s great that the ferry system modifies its schedule to accommodate school and cultural activities. It was a beautiful ride, with a little rain off and on. It even rained the night before in Petersburg – our first real rain since we’ve been in Alaska. I’m still not believing how fortunate we’ve been. There was lots to see on the ferry ride. I happened to spot a lighthouse and learned that it was the Five Finger Lighthouse, which stands on the site of the first U.S. lighthouse built in Alaska. Completed in 1935, it is the only Art Deco style lighthouse I’ve ever seen. This style seems to be unique to Alaska, and the Five Finger Lighthouse is one of an interesting group of Art Deco concrete towers built during the late 1920s and 1930s. The ride through Frederick Sound provided us with a good opportunity for whale watching, and we lucked out with several humpback whale sightings. I wasn’t very quick with the camera, but did catch a few tails. We also spotted several glaciers. Where's the Rest of You? After making it safely to Juneau, we proceeded to the Mendenhall Campground, one of the fanciest U.S. Forest Service campgrounds I’ve ever seen. Many sites had full hookups, and the Verizon 4G signal was very fast. It was foggy and cloudy when we arrived, and it even rained for a while. I swear, it really did rain! Although the campground was not full, I’m glad we had a reservation. The campground is rather odd in that you cannot walk in and pay for a site. All campsites must be booked through Recreation.gov. You can do this in advance, or before 8:00 pm on your day of arrival, and there is a reservation fee as well as the campground fee. I wouldn’t want to have to deal with trying to make a reservation online or on the phone after a long ferry ride. For the last two weeks, Tim and I have been traveling in some pretty remote parts of British Columbia and Alaska. We’ve hiked, driven, and boated in wilderness-like areas and have only seen one bear, and that one was along a major highway. 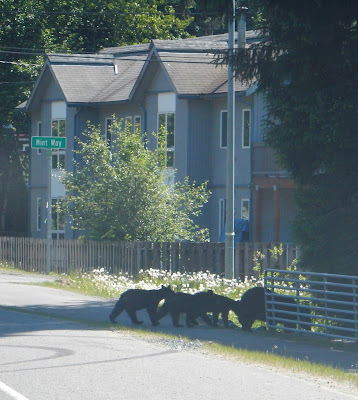 So, imagine my surprise as we were driving in a “suburban” area of Juneau, in the middle of the day, when a mama bear and her three cubs walked across the road in front of the car in front of us. I usually have my camera handy, but not that day. I was watching the action as I scrambled to pull out the camera to record the moment. It’s a pretty lousy photograph, but I will include it anyway. I assumed that Tim would pull over so I could get a better photo, but no, he just kept going. I was incredulous. 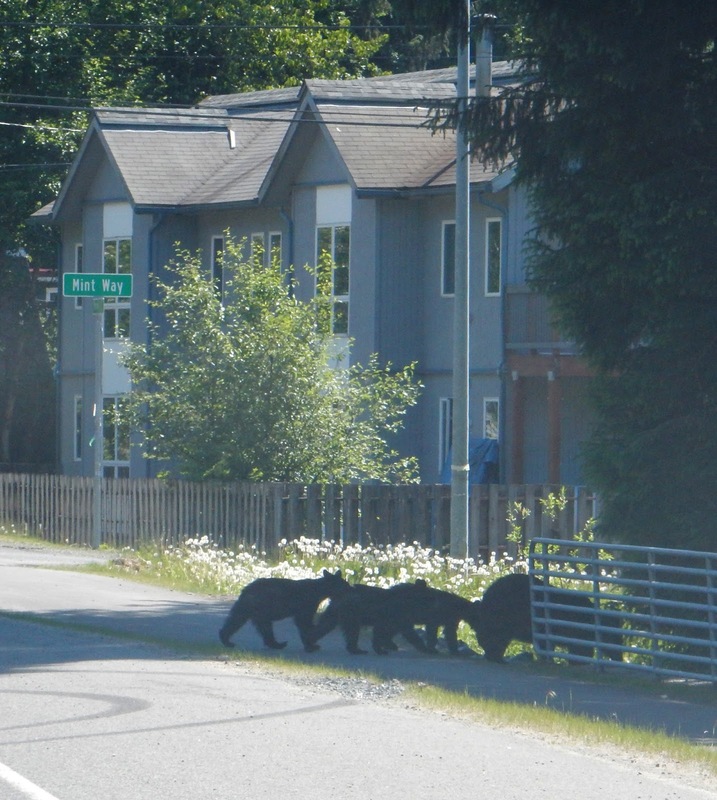 A mama bear and her cubs – isn’t that worth a stop? He was completely oblivious to the moment. Too many elk jams while we lived in Estes Park, I guess. Almost every cruise ship visits Juneau, and there are so many things to do here that it can make your head spin – walking tours, whale watching tours, flightseeing tours, helicopter tours that land on a glacier, fishing charters – you name it, you can do it here. Juneau has a nice downtown that is set on a hill that steps down to the water. As the state capital, government is a major focus. We enjoyed walking through the downtown area and visiting some of the historic buildings. 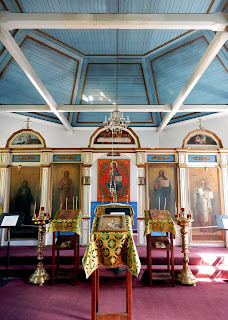 We toured St. Nicholas Russian Orthodox Church, a very picturesque structure and the only remaining octagonal Russian Orthodox church in Alaska. We learned that a major preservation project is underway. We had hoped to tour the State Capitol Building and the Alaska State Museum. It turns out that quite a few state buildings are currently being retrofitted, or replaced, all at the same time, so we struck out on both of those. 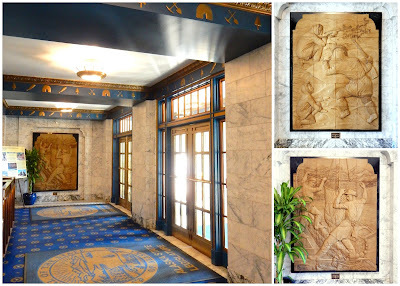 We were able to get as far as the lobby of the Capitol, which features a unique cornice with Alaskan motifs, as well as WPA-era relief panels. The building is one of the few Art Deco style capitol buildings in the United States. 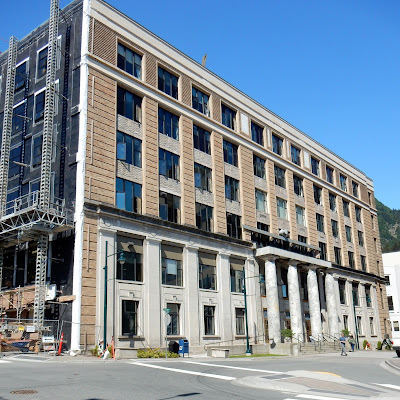 I had never really associated Alaska with Art Deco style architecture, but I have come across quite a few buildings, including the Capitol, several downtown commercial buildings and even lighthouses. It’s been fun to actually seek them out. We wandered by the Governor’s Mansion and took the steps down to the dock area. Since the Alaska State Museum was closed, we decided to visit the brand new Walter Soboleff Center, a cultural center for the Sealaska Heritage Institute. 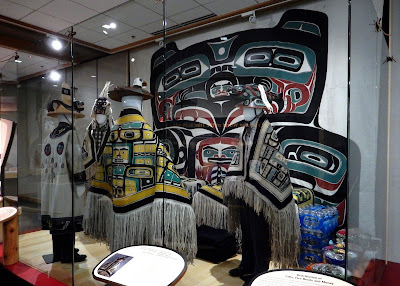 Sealaska is the regional Native corporation in Southeast Alaska, and the institute seeks to perpetuate and enhance Tlingit, Haida and Tsimshian cultures. 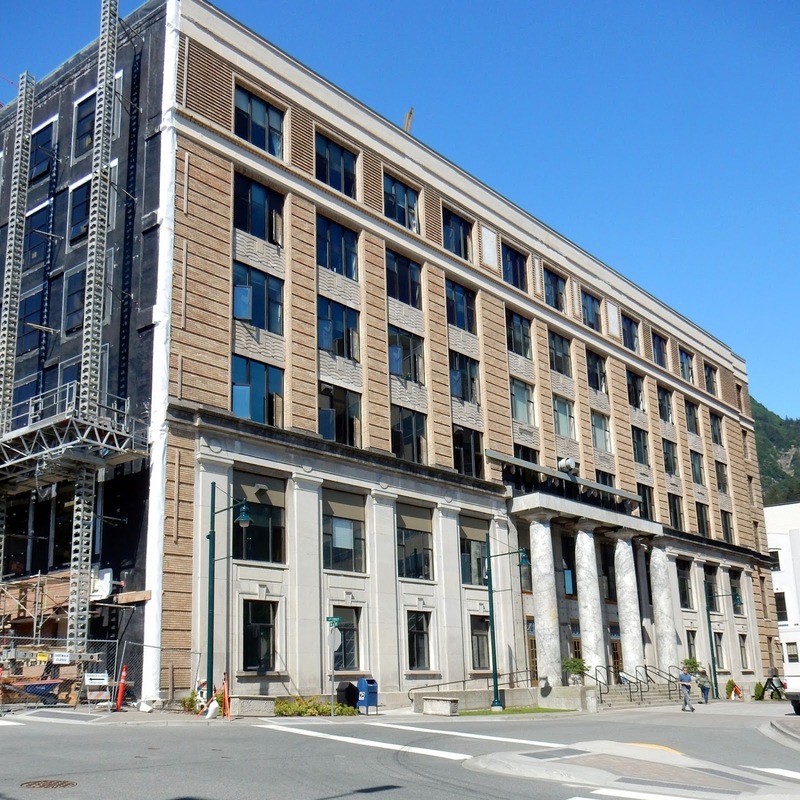 Dedicated just two weeks ago, the center’s is a fabulous addition to downtown Juneau. The center is a visual delight, from the interesting architecture to the monumental works of art that were created for the building. 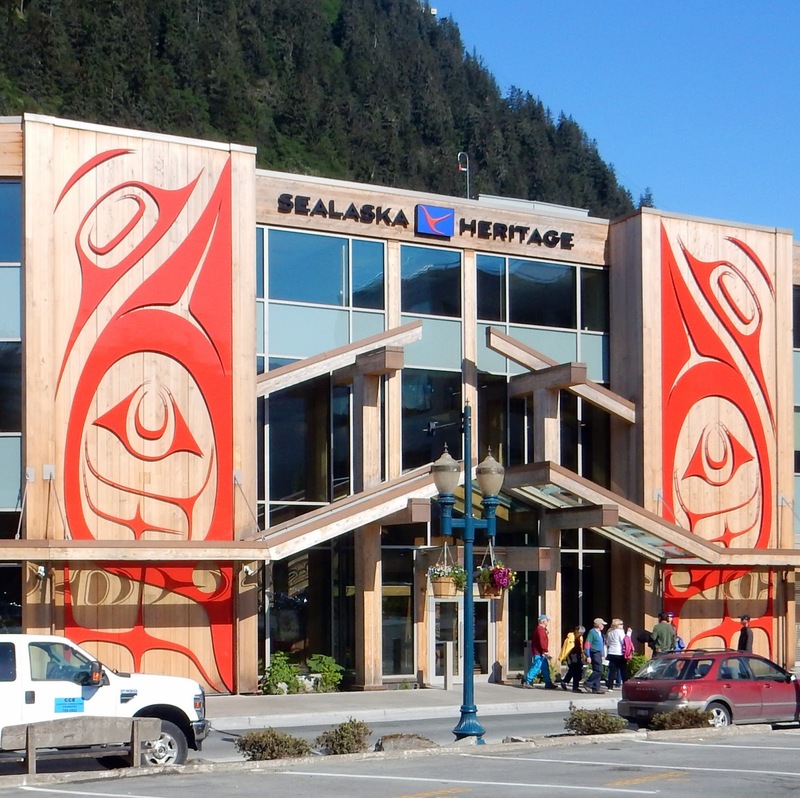 The center allows Alaska Natives to share their heritage, culture and arts with the rest of the world. Although the main exhibit was small, it was very well done. The exhibit illustrates the traditions that are based on the four cultural values of the three Native Alaskan peoples – family, land, strength and balance. A mixture of contemporary and historic pieces illustrate these core values, and the pieces were true works of art. 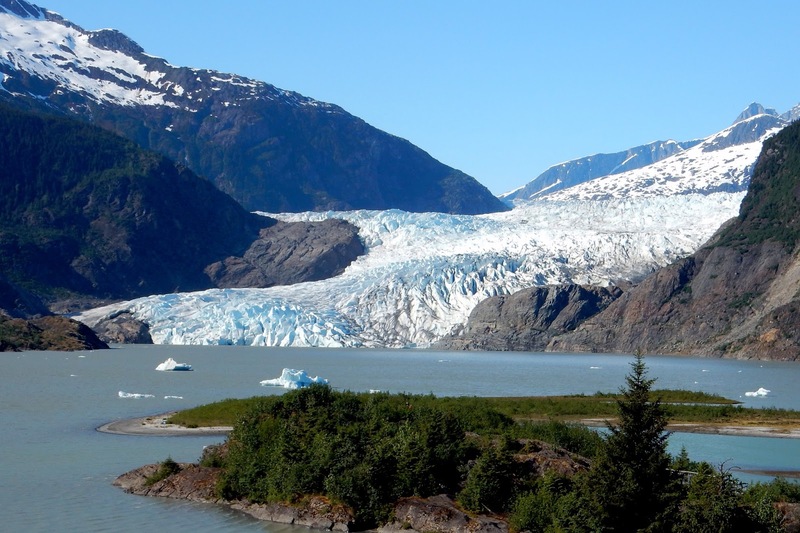 Almost everyone who travels to Juneau visits Mendenhall Glacier, an “urban” glacier and one that you can actually drive to. Of course, we wanted to go as well, but we really hoped to avoid the cruise ship crowds. That’s a little more difficult in Juneau, since the ships often do not leave until late in the evening. We thought 5:30 pm might be a good in between time, and indeed it was. Several buses were just leaving, and another group did not arrive until we were heading out. That was good timing. Late afternoon is also the best time of day for photographs. Although the visitor center is open until 7:30 pm, we found that the face of the glacier is in shadows by around 6:30 pm, depending on the month, so don’t wait too late in day to go. Mendenhall Glacier is an impressive sight, and it is neat to be able to get so close to it. 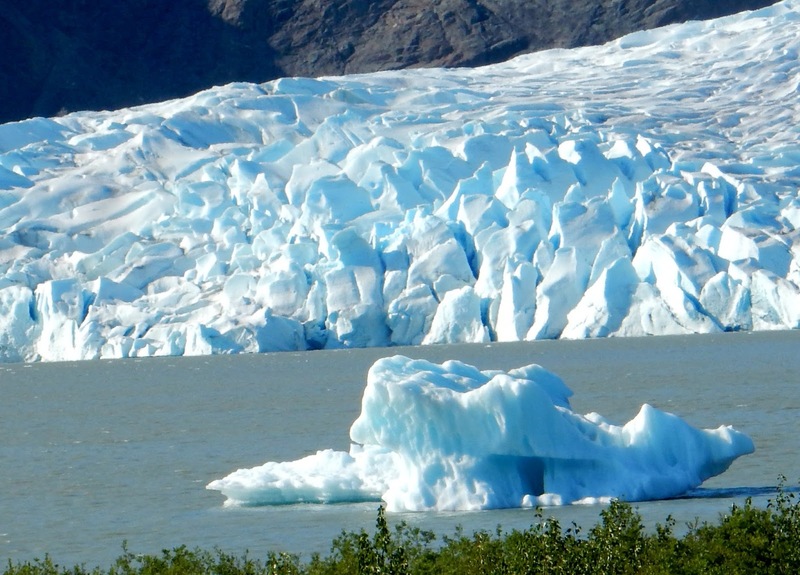 Mendenhall is a tidewater glacier, a glacier that descends to the sea and typically breaks off into icebergs. It’s also a glacier that should be visited sooner rather than later. The glacier is shrinking, and it is amazing to see how far the ice has retreated in just a short period of time. Tim and I have been enjoying all of the delicious seafood that Alaska has to offer. One surprise, however, on almost every menu has been fish tacos. Almost every restaurant, whether funky or elegant, features them prominently. I love fish tacos, and I’ve made it my mission to sample as many as possible. It’s amazing how different each one is prepared, but I’ve enjoyed them all. The ones in Juneau at the Capital Cafe contained halibut and were quite tasty. We had planned one major tour for our visit to Juneau, and that was a day trip to Glacier Bay National Park. I’ll tell you all about it in the next post. Thank you. You would love it here. It's hard to pick what I like best - the scenery including the glaciers, or the wildlife. How very cool to see mama and her three cubs!! Husbands just don't get it!! Glad you got a photo:) The blue ice is my favorite part of the glacier. Just gorgeous! I was so excited when I saw them. They were very close and so cute. I'm glad you understand about husbands!! I have to give him a lot of credit, however, since he is so patient with me (most of the time) when I want to take photos. Also loving your pictures. With us it is just the opposite though. I want to slow down see everything and take photos of it all. The wife just glances and then says as we drive by, 'Oh did you want to stop' or 'I didn't see a good place to pull over'. Some times it infuriates me since I know I'll never get that shot again. I'm sure that some wives can be just as exasperating! I know exactly how you feel. I guess that everyone has their own priorities and interests. Maybe we just need to speak up and say "Stop!" and not assume the driver is a mind-reader. Juneau is a wonderful city. I'm looking forward to your pictures of Glacier Bay - I've never been there but hear it is amazing. I'm going to have to add fish tacos to my list! 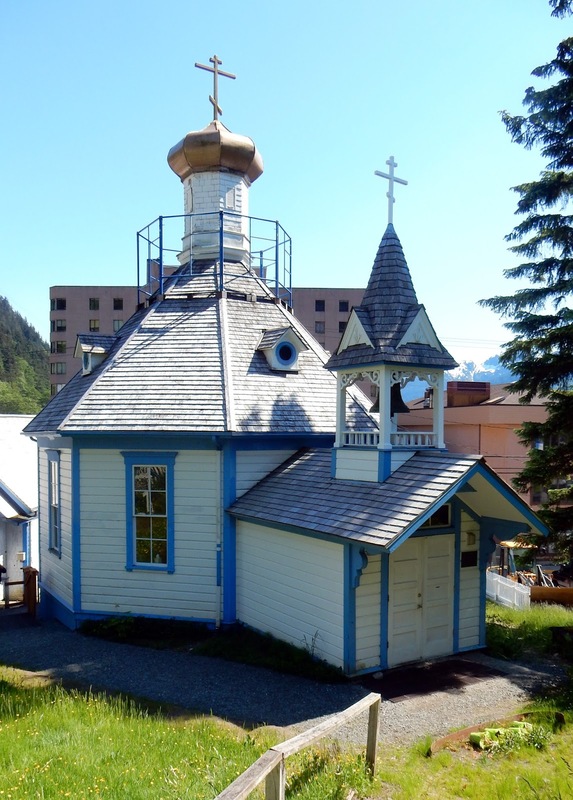 A lot of people dislike Juneau, but we really thought the city had a lot to offer. We are working in Sitka right now, so between an eight-hour work day and sporadic WiFi, the posts are a bit behind. It's also extremely difficult to select among the hundreds of photos I took in Glacier Bay! Soon, I promise! 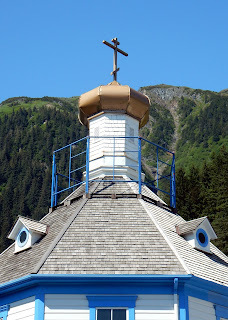 We really enjoyed Juneau when our cruise ship stopped there. We didn't spend much time in town, though ... whale watching was on my mind ;-) And of course, Mendenhall Glacier. 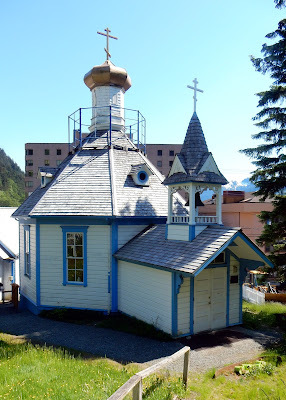 We would love to stay in Juneau for a few days and explore it in more depth. Those fish tacos look yummy. Seafood in Alaska ... hard to go wrong with it. Fresh salmon and fresh halibut ... amongst my favorites. I can certainly understand making whale watching a priority. We've seen a few from the ferry, but not as many as I had hoped. We are loving Alaska seafood and can't wait until the salmon start running.